Please send me the price for a Sharp AL 1566 copier? I live at Limpopo Makhado (Vuwani). Sorry, we only sell the Sharp AL-1566 toner cartridges rather than the printer itself and we only deliver within the UK. When I photocopy, my AL-1566 printer is making a line in the middle, what could be the problem? And can I get rid of that? It's possible that the toner is not reaching the middle of the page. We suggest that you remove the toner from your AL-1566 copier and rock it gently from side to side in a see-saw motion, this may resolve the problem. If not, please contact Sharp for technical support. Any copy quality problem that can't be resolved by changing the toner cartridge may be attributed to the imaging drum in your Sharp AL-1566 printer. 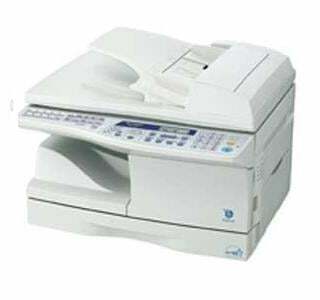 The Sharp AL-1566 is a multifunction machine that can print, copy, scan, and fax. The Sharp AL1566 has a monochrome laser printer that can deliver good quality output at a reasonable speed. Scans, faxes, and copies are also of high quality. The maximum printing resolution is 600 x 600 dpi and image manipulation for scanning can be enlarged up to 400%. The Sharp AL-1566 does not offer support for Macintosh. The AL-1566 multifunction printer is quite bulky. It has a scanner on top with a flatbed scanner. The control panel is organised and has function buttons and an LCD display. Paper cassettes and trays are located at the bottom and the Sharp AL-1566 copier printer can handle 250 sheets at a time plus another 50, which is located at the sheet bypass. This printer has a copy speed of 15 cpm and it can print out the first copy in 9.6 seconds. With just one machine, the Sharp AL1566 laser printer, users can already do 4 functions. This multifunction printer has good quality output from scans and faxes to prints and copies, delivered at reasonable (if not quick) speeds. Networking is easy and sharing the Sharp AL 1566 can be done as this printer has a built-in Ethernet. The AL1566 printer does not offer support for other computers aside from Windows computers. The Sharp AL-1566 printer could have been better if it had Wi-Fi.